A video has been circulating of a fish that “can’t be killed”. On first glance, it appears to be a fish that’s had its head removed and been cut in half, but is nevertheless still flapping around. 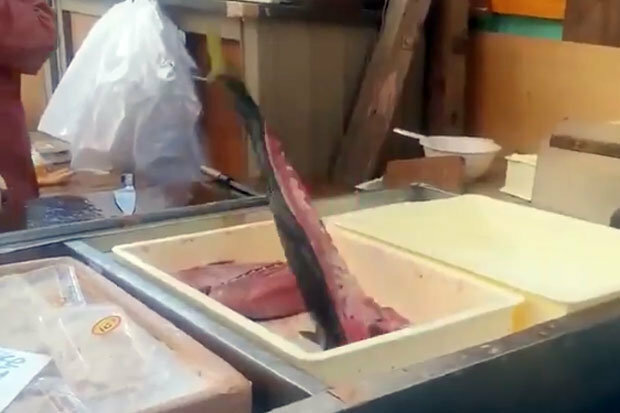 For those of you too faint of heart to watch it, the fish thrashes around pretty violently, so much so that it nearly comes out of the container it’s in. It’s pretty distressing, and not behavior you’d expect from a fillet. The fish’s brain is no longer functioning, but its muscle tissues are still alive and can respond to stimuli such as table salt or soy sauce. When these make contact with the adenosine triphosphate in the muscles of a recently deceased fish, it can cause a chemical reaction that stimulates contractions, as you’ll see below. What’s more, it’s not just this fish. It can be replicated with others. There are especially strange videos that circulated a few years ago of “dancing” dead squid. Well, the fish are not alive, thankfully, so you can stop calling PETA. There is no brain activity in any of the fish, nor any other signs of life. No pain is felt by the fish, because the fish are not alive to feel it. The movement comes from a chemical reaction that stimulates the fish’s muscle tissues. For some time after death, muscle motor neurons within these tissues still have some membrane potential. The fish’s brains are very much dead, but most of their tissue is very much alive in these viral videos. In this case, adding salt to the fish (in the form of table salt or soy sauce) can trigger muscle spasms in very recently deceased fish and cephalopods. The salt gets absorbed and changes the voltages across nerve cell membranes, triggering the (somewhat violent) contractions of the muscle you see.